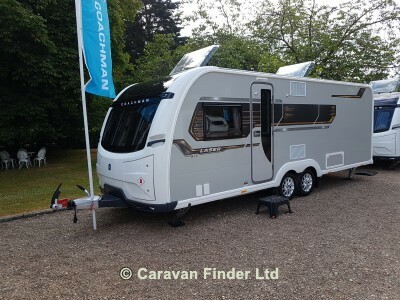 Laser 675 Practical Caravan awards winner 2019 for Best twin axle caravan for couples The all new Coachman Laser is the twin axle flagship range for 2019 and is packed with extra features, a higher specification and more luxurious touches than ever before. Each has contemporary cranked style two-tone locker doors to the lounge and bedroom with soft close hinges, as well as modern new LED layered lighting forming a tranquil ambience. Additionally the 12v Seattle multi-function digital control panel gives you all the power at your fingertips. Take life's journeys in the height of comfort with the all new and improved eye-catching Laser range with Laser 3D exterior graphics and Silver Grey side walls.